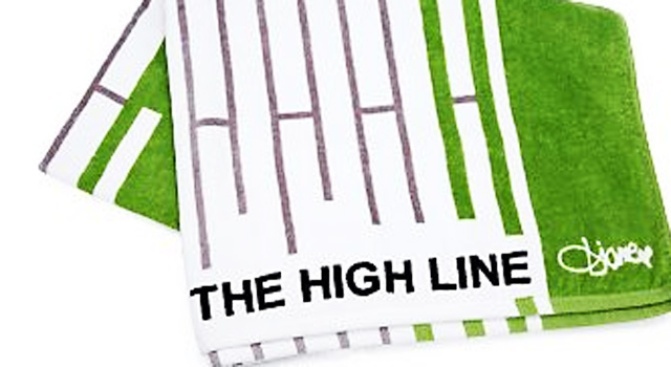 Diane von Furstenberg's towel tribute to the High Line. ELEVATED: Diane von Furstenberg’s snappy 36"x60" beach towel celebrates the just-opened High Line (her shop’s Meatpacking neighbor) in more ways than one: a part of the proceeds will benefit Friends of the High Line Conservancy. $75; more information here. KICKY: Through Saturday, your new favorite shoes from Classic Kicks drop up to half their price tag: Vans Slip-Ons are now just $25, for instance. The sale covers goods for men, women and kids. 298 Elizabeth Street near Bleecker Street; 212-979-9514. BARNES RAISING: To celebrate today’s opening of the new Barnes & Noble at 86th Street and Lexington Avenue, get a double deal: Take 40% off all CDs (yes, even boxed sets), and snag an extra 20% off any single item in store. More information here.